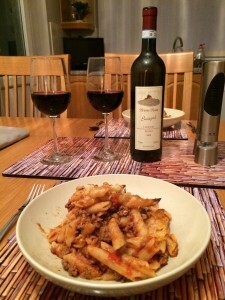 We were looking for a recipe online for a midweek meal and found Spicy Mince Pasta Bake from RoosterandHen on the AllRecipes website. We used Penne and this was baked in the oven with a mixture containing onions, garlic, smoked bacon, minced beef, red chilli, mixed herbs, Cayenne pepper, paprika, tomato purée, white wine, chopped canned tomatoes, mushrooms, Mozzarella, Parmesan and breadcrumbs. We opened a bottle of Bricco Rosso Suagna Langhe Rosso 2008, a medium-bodied Italian red from the Wine Society. 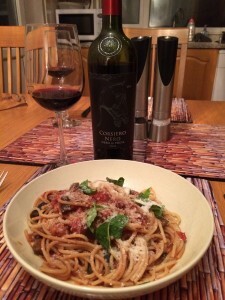 The wine is a blend of Dolcetto and Nebbiolo and we tasted red fruits, especially cherries, vanilla notes with good tannins and acidity on the finish. A good match. 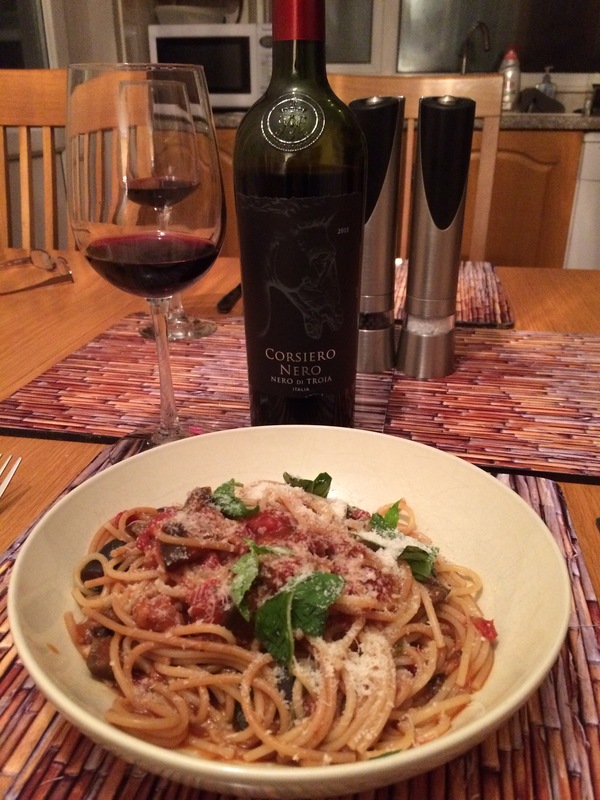 We found a great midweek pasta meal on BBC Food – Creamy Chilli, Bacon and Tomato Spaghetti by Justine Pattison. Spaghetti is coated in a sauce containing onions, streaky bacon (we used pancetta instead), garlic, chilli flakes, chopped tomatoes, tomato purée, oregano and cream. A tasty and delicious recipe with a spicy kick. 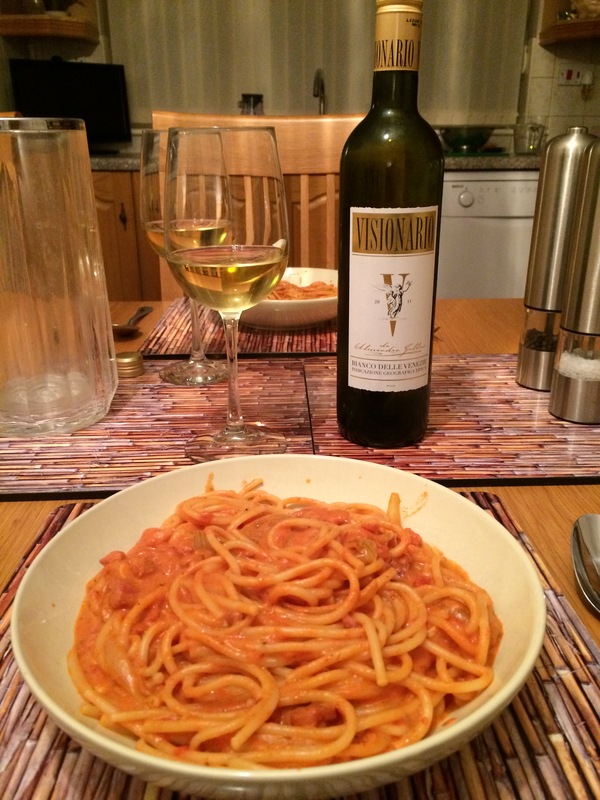 We opened a bottle of Visionario 2011 Venezie IGT, an aromatic Italian white blend from the Sunday Times Wine Club. 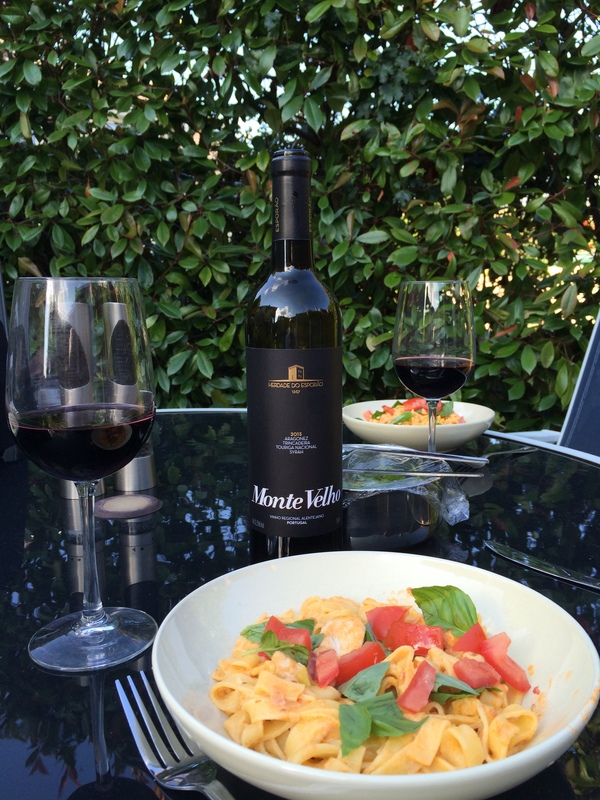 We found this wine refreshing with creamy grapefruit flavours and a good match with the pasta. 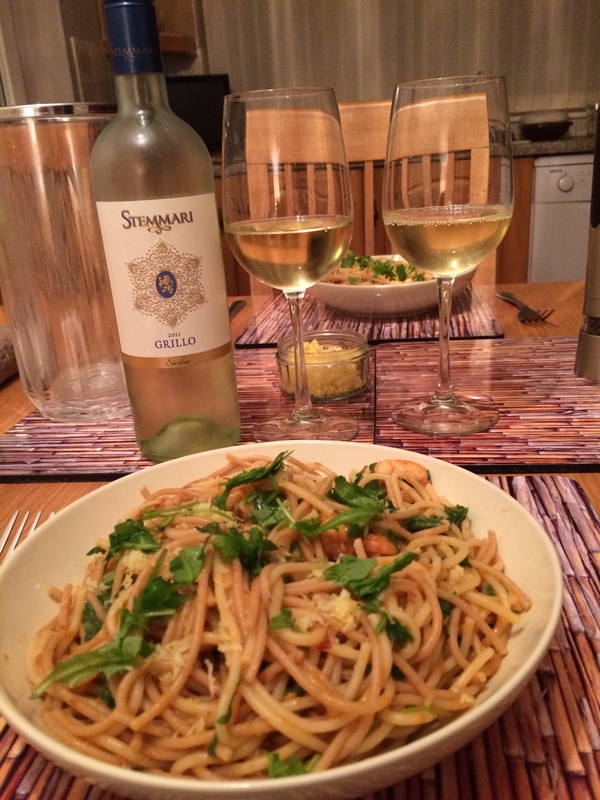 We thought the wine might pair even better with less spicy dishes. We needed to use up some ham and found a recipe by Mary Berry online on the BBC Food website. The recipe uses Parma ham but we used ordinary ham together with mushrooms, crème fraîche, salt and pepper and grated Parmesan cheese. Penne pasta is stirred into the mixture and chopped parsley is sprinkled over. We served with crusty bread and thoroughly enjoyed this simple but tasty recipe. 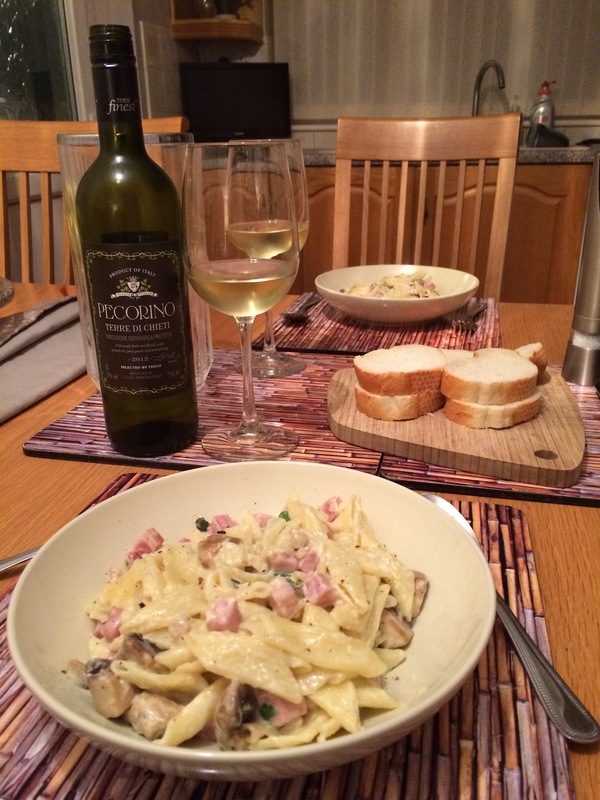 To pair with the meal we opened a bottle of Tesco’s Finest Pecorino Terre di Chieti 2012, an Italian white. This was fresh, crisp with creamy grapefruit, peach and pineapple. 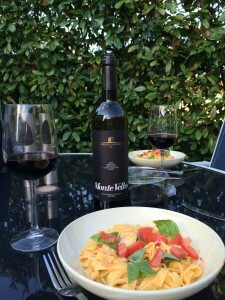 This enjoyable wine was a very good match with the pasta. 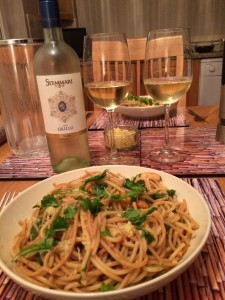 Last time we drank Stenmari Grillo Sicilia 2011 was with a Tagliatelle Bolognese and we made a note to try this Italian white from the Wine Society with fish or seafood next time. We found a recipe in our Jamie’s Italian cookbook called Spaghetti con Gamberetti e Rucola (Spaghetti with Prawns and Rocket). The sauce contains prawns, garlic, red chillies, white wine, sun-dried tomato purée, zest and juice of lemon and rocket. 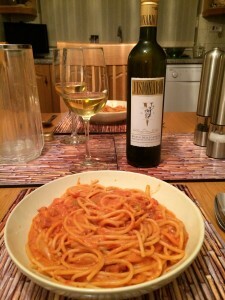 Lemon zest is sprinkled on top of the spaghetti too when serving and so the dish had a definite spicy and lemony kick. 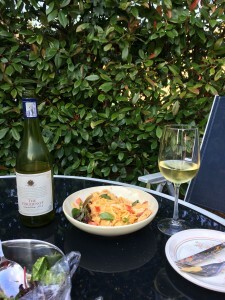 It seemed very appropriate to pair this dish that Jamie discovered in Sicily with a Sicilian wine and we found it fresh, crisp, citrussy, zesty with a grapefruit finish. It coped well with the strongly-flavoured sauce.